All in One: This Deluxe DIY BBQ Sauce Kit includes EVERYTHING you will need including an instruction booklet to make 3 BBQ Sauce recipes in the comfort of your kitchen! he Finest Ingredients: We use all-natural ingredients including Cayenne, Crushed Red Pepper, Turmeric, Paprika and MORE! The Perfect Gift: Our kit was created for people of all ages and skill levels in mind, making it the ideal gift for any occasion. Made in the USA: Our premium kits are proudly crafted in Portland,OR. Guarantee: We're so sure you'll love our DIY sauce kit, we offer a lifetime guarantee! 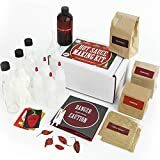 Grow and Make DIY Artisan Gourmet Hot Sauce Kit - Make 3 Unique Sauces at home! Grow and Make DIY Mustard Making Kit - Learn how to make home made mustard!